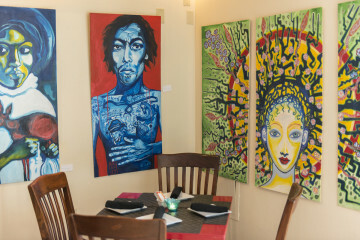 Brunch at Zenith includes vegan almond French toast and a dessert table worth visiting. From tiramisu French toast to down-home shrimp and grits and sizzling shakshuka, brunch can be whatever treat you’re craving. Maybe it’s paired with a steaming mug of organic coffee or with a sparkling mimosa — or both. No matter your pleasure, Pittsburgh has a growing array of eateries offering exceptional brunches. From fine dining restaurants to casual eateries, here are more than a dozen of our favorite brunch destinations. A brunch spread at Pie For Breakfast, Oakland. Chef Trevett Hooper, who owns the acclaimed Butterjoint and Legume next door, envisioned Pie for Breakfast like this: “Imagine if a truck stop and a European coffee shop had a baby.” He somehow managed to create just that, offering classic comfort food with locally-sourced ingredients (try the meatloaf with cheesy grits, beef gravy, cucumber salad and collard greens) alongside creative dishes like the Fancy Omelette, featuring escarole, shishito peppers, onion jam, raclette cheese, home fries and Appalachian salt-rising bread. Every brunch dish comes with Commonplace Coffee and either a mimosa, a mule (Moscow to Kentucky) or a Bloody Mary. Plus, of course, there’s pie. Breakfast is served all day, 8 a.m. to 3 p.m. This shop, packed to the rafters with art and antiques, also has a good café inside. 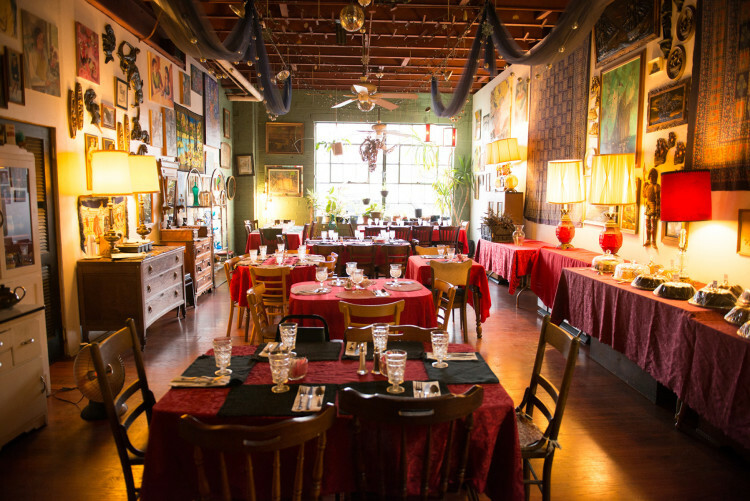 It’s known for sending Pittsburgh’s vegan/vegetarian community home with full bellies — and often with some cool kitschy vintage stuff as well. The menu changes weekly, including dishes like Vegan Linguine & Artichoke in White Bean Sauce and Vegan Almond French Toast, but the dessert table is probably the main draw. These vegan desserts are definitely not pale imitations of their buttery cousins, so indulge. And along with the food, everything in the room — from the lamps to the mismatched tableware — can be purchased. Brunch is served Sundays, 11 a.m. to 2:30 p.m.
Another vegan place that’s so good even carnivores won’t miss their eggs and bacon. Bonus: heavy metal puns galore. There’s “Fig Destroyer,” toasted raisin bread topped with cashew cream cheese, figs, blueberries and cinnamon with a chrysanthemum syrup drizzle, referencing the band Pig Destroyer. There’s also “(Sc)ramble On,” a tofu scramble taco with potato homefries, smoked maple shiitake mushrooms, shredded cabbage, salsa and mayo wrapped inside a corn tortilla (love the Led Zeppelin reference). 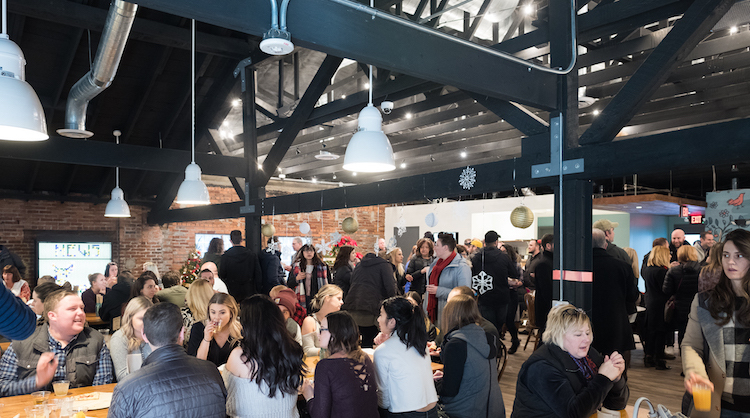 Brunch is served Saturdays, 10 a.m.-2 p.m.
Threadbare Cider House & Meadery. Photo courtesy of Threadbare. This out-of-the-way spot on the North Side specializes in cider and mead but also features a way-better-than-necessary kitchen. In fact, the food is worth the trip itself, particularly for brunch. Breakfast pizzas are the specialty. Try the Threadbare Hash Pizza topped by mozzarella, smoked potato, onion, eggplant and scrambled egg. 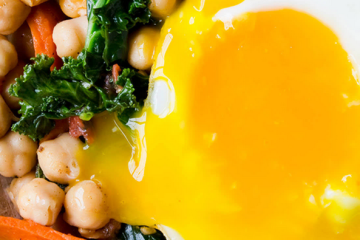 There’s also a kale pizza with anchovy, “pickled cherry bombs,” saladette tomato, mozzarella and a sunny side up egg. Platters include The Brine, featuring whiskey barrel-fermented sour pickles, bread and butter pickles, seasonal vegetables and eggs, and The Beast, a charcuterie plate of country pate, genovetta, coppa secca, capicola and pickled grain mustard. And don’t miss the pancakes. Brunch service Sundays, 11 a.m. to 4 p.m.
One of Pittsburgh’s most stylish dining rooms sits on the second floor of the Fairmont Hotel, and the food is just as good as the decor. You can pair Poached Eggs with lobster, spinach, gougère pastry and Hollandaise sauce with a Grapefruit Tarragon Mimosa, or a serving of corn masa Pupusa with pork belly, Oaxaca cheese, pickled cabbage and salsa roja with a Rise and Grind cocktail, featuring Hazelnut Espresso Vodka, coffee, Bailey’s and walnut whipped cream. Even the French toast is elevated, slathered in smoked maple syrup, vanilla mascarpone and candied almonds. Brunch served Saturdays and Sundays, 11 a.m. to 2 p.m.
One of the standouts of our Best New Restaurants, Class of 2017, is this tiny little acorn of a restaurant in Shadyside. They’ve since branched out into brunch with solid dishes like Scallion Pancakes served with mushrooms, peas, sesame, chilies and soft scrambled egg, and Shrimp & Grits with shrimp coated in Crystal hot sauce, chow-chow and crab boil sauce. You can also start a weekend morning with fish tacos spiced with chili, lime, radish and black mint in a corn tortilla. 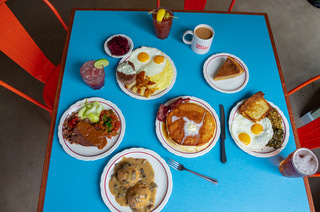 Brunch is served Saturdays and Sundays starting at 10 a.m.
At one of Pittsburgh’s best all-around restaurants, brunch is not an afterthought. The Spit Roasted Turkey Sandwich features layers of roasted turkey on a large flaky buttermilk biscuit with bacon, lettuce and tomato and a fresh egg perched at the top. A kick of chili mayo brings all the flavors together. This Downtown eatery also features seasonal and handmade takes on classic brunch dishes. Cinnamon roll French toast is topped with Millie’s maple oat ice cream and Pennsylvania maple syrup. Omelets with braised bacon and egg scrambles with fresh veggies are on the menu along with items from Union Standard’s raw bar and wood-fire grill. Cocktail highlights include “Maggie’s Morning,” a blend of Maggie’s Farm Rum Coffee Liqueur with Gosling’s rum, a cold brew coffee served with cognac and Union’s take on the Bloody Mary and mimosa. Brunch is served Saturdays and Sundays, 10 a.m. to 2 p.m. Reservations are accepted and probably a good idea. Brunch, served seven days a week, is a cornerstone at this seafood and chop house. 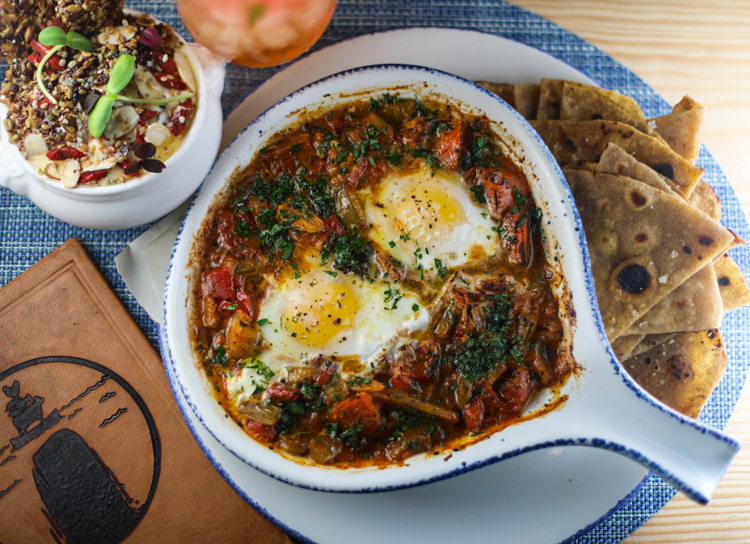 The Tunisian-inspired shakshuka (eggs poached in a ragout of tomatoes, chili peppers, onions and spices) is a great pick. And even the extras are next-level: They make the crackers, chapati, English muffins and biscuits all from scratch. Or, the Whale’s new bar program is also strong. The brunch cocktail selection is beachy and breezy, featuring a housemade gin and tonic, an aperitivo spritz, an apricot-flavored mimosa, a bellini and a good Bloody Mary featuring their own hot sauce. Brunch is served 8 a.m. to 2 p.m. As with Union Standard, reservations are a good idea.